The drive was enjoyable. I rather liked the freedom of being off on my own and finding my way to a place. I had a dim idea of how to get there and a mental map, plus an idea of how far out of Prineville I needed to drive. It’s sort of like putting together a puzzle: can you do this and not get lost? My inate sense of direction always wins and I did it without a misstep. It was so pretty! The mock orange was blooming everywhere and the grass in the fields was still green. I arrived in the middle of the day, so the men were still out working on trails. Got settled, visited with the wife of one of the volunteers, and went exploring around the campground with my camera. And lots of butterflies like these little blue guys. These are Melissa Blue butterflies. I also identified the Common Wood Nymph (western) and saw several I just could not get close enough to identify: a frittilary, a skipper, a comma and a sulphur. there are so many myriads of butterflies!! I also noted a western tiger swallowtail and a pale swallowtail, but who can get a photo!? I was lucky to capture the Melissa Blue butterflies. These little monkey flowers were among the few wildflowers still blooming. Wild daisies, sticky asters, mullein, and a lot of flowers I only got “close” to guessing what, exactly, they are. I did pin down the hot rock penstemon, but not with a photograph. It’s white instead of blue or purple. Saturday was supposed to be the day Don and I had to ourselves. Instead, it started with a disaster. 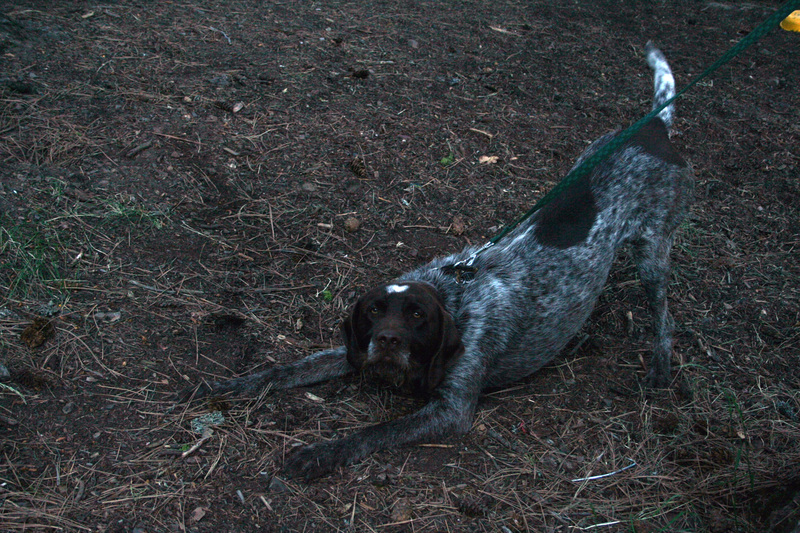 Our first hint of a disaster was finding the hard black case to Murphy’s electronic collar tossed out in the brush. Certainly Murphy didn’t do that (he hardly feels the shock so please don’t tell me how cruel it is — I felt the same until I met Murphy and discovered the use of such a device). Then a back pack was missing out of the cab of a truck. And two bottles of whiskey had been removed from the picnic table. Friday night and only twenty miles from Prineville: our fine group of volunteers had become the victims of a crime. Darn, I am so mad! We searched high and low, hoping the thieves tossed out the items they deemed useless (like the black case, tossed because it didn’t hold a gun, no doubt), but there was nothing. The mood was dark as Don’s compatriots packed up and readied to head home. These men give their time, energy, and personal finances to rebuild historic trails and keep the West open and accessible to anyone able to get out and hike. They spend their own vacation time or retirement hours, and they don’t get paid – and some pair of young twerps sneaks in and steals from them. Lost was a personal GPS, some hard-earned handles to a cross-cut saw, and a USFS digital radio. Gone was a sense of security. PArt of this trip was nostalgic: when Arwen & Levi were 4 & 6, we drove down through this country. We stopped at the agate beds where Don’s crew worked on trails but we decided not to camp there. I no longer remember why we didn’t want to camp there. We drove past the campground (we were poor and didn’t want to pay money to camp), finally deciding to pull in at the trailhead to Stein’s Pillar. The pillar is a result of volcanic activity in the area. the trail in to it is about two miles long, coming in from the south along the sidehill. We did walk in, then headed back to camp separately: Don was busy looking for agates along the trail and I took the kids back to camp. Or thought I did. It’s the only time I lost a child. I turned around and only one child was with me: Arwen. I had no idea where Levi was! My first thought was rattlesnakes. Nowadays, it would probably be cougars. Levi had no thoughts: he just decided to turn around and go back to find his dad. Good thing he inherited his dad’s sense of direction and he stayed on the trail – Don brought him back to camp. Don was a little bewildered by how he ended up with Levi, but he wasn’t mad at me for losing him. We were both well aware that Levi made a choice somewhere along the trail and just wandered off the other direction. It could have been a disaster, but it wasn’t. Back to the present: we returned to the campground and enjoyed just sitting around and visiting. The camp hostess came over and shared some of her vast knowledge and store of tales. She’s 79 and has been doing the campground hostess thing for 19 years. She’s “donated” two tents to the bears. She harvests the wild herbs and berries and cans almost all of her own foods. She told me how to make “canned cake” (well, almost the entire recipe – timing was not included in the instructions) and she shared some of her chokecherry jelly with me. (But she did not share the location of her chokecherry bush, darn it!) She makes tea out of the wild mullein and rose hips. She’s spry and healthy and does this all summer long: April – November. Then she heads to warmer climes. This is our campsite. Murphy did pretty good on the line.